Will Ferrell is back, and he’s teaming with Anchorman director Adam McKay and scene-stealing legitimate actor turned professional dufus John C. Reilly in the new lowbrow comedy Step Brothers! You see, it’s funny because they’re both middle aged and they still live with their parents! Hahaha, they’re losers! There’s farting and grown men in their underwear and emotionally-stunted man-children screaming, preening, and chewing the scenary! Ahahaa, it’s mad l0lz, yo! Or is it? Am I being sarcastic? Yes. Either way, to see just how this movie went wrong, and what the one good thing about it was aside from an uncharacteristic divergence from the normal plot progression of these sorts of movies, click here for lots of Den of Geek goodness and a review from me. 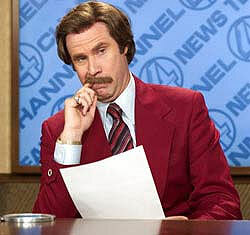 And to think, I loved Anchorman in spite of its flaws. Feel free to leave comments and register; if I remember right, DoG is giving away an iPhone. This entry was posted on July 29, 2008 at 12:50 am and is filed under Comedy, Den of Geek, Movies, Reviews, Shameless Self Promotion. You can follow any responses to this entry through the RSS 2.0 feed. You can leave a response, or trackback from your own site.